The Broadwater Farm riot occurred on the Broadwater council estate in Tottenham, North London, on 6 October 1985. The events of the day were dominated by two deaths. The first was that of Cynthia Jarrett, an African-Caribbean woman who died the previous day due to heart failure during a police search at her home. It was one of the main triggers of the riot in a context where tension between local black youth and the largely white Metropolitan Police was already high due to a combination of local issues and the aftermath of another riot which had occurred in the Brixton area of London the previous week following the shooting of a black woman (Dorothy 'Cherry' Groce) during another police search. In July 2014, the Metropolitan Police Commissioner, Sir Bernard Hogan-Howe, apologised "unreservedly" for the shooting and the time it had taken to say "sorry" following an inquest into the death of Dorothy "Cherry" Groce, whose shooting by the Metropolitan Police triggered the riots. Mrs Groce had survived the police shooting but remained paralysed and confined to a wheelchair until her death in April 2011 at the age of 63. The jury inquest blamed the Metropolitan Police for failures that contributed to Groce's death. The second death was that of PC Keith Blakelock, the first police officer since 1833 to be killed in a riot in Britain. At 13:00 hrs on 5 October 1985, a young black man, Floyd Jarrett, who lived about a mile from the Farm, was arrested by police, having been stopped in a vehicle with an allegedly suspicious car tax disc. He was taken to nearby Tottenham police station and charged with theft and assault (he was later acquitted of both charges). Five and a half hours later, D.C. Randle and three other officers decided to search his mother's home, also close by. Forty-nine-year-old Mrs Jarret immediately collapsed and died from a heart attack during disputed circumstances. During the coroner's inquest into Mrs Jarret's death, her daughter, Patricia claimed to have seen D.C. Randle push her mother whilst conducting the search inside their house, causing her to fall. Randle denied this allegation. Cynthia Jarrett's death sparked outrage from some members of the black community against the conduct of the Metropolitan Police. There was a widespread belief that the police were institutionally racist. A black woman, Cherry Groce, had been shot by police a week earlier in Brixton. Four years earlier, the Scarman Report into the 1981 Brixton riot criticised police. In particular, the local council leader, Bernie Grant, later condemned the search and urged the local police chiefs to resign immediately as their behaviour had been "out of control". There was a demonstration the following day outside Tottenham police station by a small crowd of people. Violence between police and youths escalated during the day. Riot police tried to clear streets using baton charges. The youths in the conflict used bricks and petrol bombs. The evening TV news claimed there were shots at the police, two officers, PC Stuart Patt, another unnamed officer, being treated for gunshot wounds. Three journalists (Press Association reporter Peter Woodman, BBC sound recordist Robin Green, and cameraman Keith Skinner) were also claimed to have been hit. Cars were set on fire and barricades made. The main conflict took place on the estate itself, with police officers and rioters injured and dozens of rioters arrested. At 9.30pm, Police and London Fire Brigade responded to reports of a fire on the elevated level of Tangmere House; this block consisted of a shopping level with flats and maisonettes above. The location itself was some distance away from the main body of rioting, and as such was being policed by units who were less well-equipped and well-prepared in terms of disorder training. The London Fire Brigade came under attack as did the 'serial' of police, including Blakelock, who were there to assist. The rioting was too intense for police not trained in riot control and they and the firefighters withdrew, chased by rioters. Blakelock tripped, fell, and was surrounded by a mob with machetes, knives and other weapons, who killed him in an attempt to decapitate him. PC Richard Coombes suffered a serious facial injury from one of the attackers when he made efforts to rescue his colleague. The rioting tailed off during the night as rain fell and news of the death spread. Afterwards, the local council invested in the estate to improve some of the problems which were seen as factors in the rioting. By 2016 and although there is still contention with the police, the area has improved. The riot prompted the Metropolitan Police to devise the Gold-silver-bronze command structure for responding to sudden major incidents. Among the difficulties with the police response was that orders had to be communicated through numerous ranks, and it was never clear who was in operational charge. Following the Death of Mark Duggan by Police in 2011, which resulted the 2011 England riots, British grime artist Scorcher (born Tayo Jarret) revealed via Twitter that his grandmother was Cynthia Jarret. Six people (three juveniles and three adults) were charged with the murder of Blakelock. The juveniles all had their cases dismissed after the judge ruled the conditions in which they had been held were so inappropriate that their interrogation was inadmissible - conditions included being questioned naked except for a blanket, and being questioned without a guardian. In March 1987, three local men, Winston Silcott, Engin Raghip and Mark Braithwaite, were convicted of murder and sentenced to life imprisonment despite no witnesses and no forensic evidence. The Tottenham Three are Innocent Campaign and the Broadwater Farm Defence Campaign pressed for a retrial. On 25 November 1991, all three defendants were cleared by the Court of Appeal when an ESDA test demonstrated police notes of interrogations (the only evidence) had been tampered with. Braithwaite and Raghip were released after four years in prison. Silcott remained in prison for the separate murder of another man, Tony Smith, which occurred in December 1984 in the Tottenham area, and for which he was convicted in February 1986. He was released on licence in October 2003 after serving 18 years in prison, despite a 14-year recommended minimum being issued by the trial judge. The officer in charge of the interrogation of Silcott and the other two men was cleared of perjury. In July 2013, Nicholas Jacobs was charged with the murder of PC Blakelock. Four other men arrested at the same time were not charged. On 9 April 2014, Jacobs was cleared of all charges. At the inquest into the death of Cynthia Jarrett her daughter, Patricia, alleged that her mother had been pushed over by Detective Constable Michael Randle, which he denied. The inquest found that Jarrett had died accidentally. No police officers were charged or disciplined for her death. 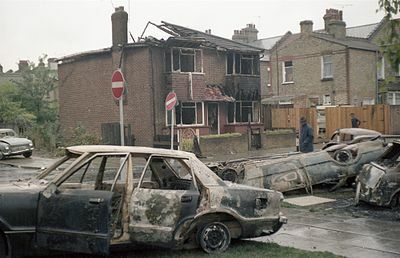 In 1985, Oliver Letwin and Hartley Booth co-authored a memo as members of then-Prime Minister Thatcher's policy unit in response to Broadwater Farm in London urging "Thatcher to ignore reports that rioting in mainly black urban areas was the result of social deprivation and racism." Broadwater Farm riot was part of a series of riots sparked by the shooting of the mother of Michael Groce — both Afro-Caribbean in a mainly Afro-Caribbean neighbourhood — by the Metropolitan Police on 28 September 1985 in the mainly Afro-Caribbean Lambeth neighbourhood, sparked a second riot in Brixton. Over the next weeks and months riots broke out in Peckham, Toxteth and at the Broadwater Farm estate in Tottenham, North London. In 1985 Letwin was then considered to be a "young star" of the Conservative Party. The memo scorned suggestions by senior cabinet ministers to set up a £10m communities programme to tackle inner-city problems by helping blacks start businesses as suggested by David Young, refurbishing public housing council blocks as suggested by Kenneth Baker and "establishing training programs for low-income youth." Letwin claimed it would not ameliorate the situation but would do little more than "subsidise Rastafarian arts and crafts workshops" stating that black "entrepreneurs will set up in the disco and drug trade". "Lower-class, unemployed white people lived for years in appalling slums without a breakdown of public order on anything like the present scale; in the midst of the depression, people in Brixton went out, leaving their grocery money in a bag at the front door, and expecting to see groceries there when they got back...Riots, criminality and social disintegration are caused solely by individual characters and attitudes. So long as bad moral attitudes remain, all efforts to improve the inner cities will founder." ^ a b "1985: Riots in Brixton after police shooting". BBC News. 28 September 1985. Retrieved 10 July 2014. ^ a b Gareth Parry, Susan Tirbutt and David Rose (30 September 1985). "From the archive: Riots in Brixton after police shooting". The Guardian. Retrieved 10 July 2014. ^ a b c d e f "Police blamed over 1985 Cherry Groce Brixton shooting". BBC News. 10 July 2014. Retrieved 10 July 2014. ^ a b c "1985: Riots erupt in Toxteth and Peckham". BBC News. 1 October 1985. Retrieved 10 July 2014. ^ a b Brain, T. (2010) A history of policing in England and Wales from 1974: a turbulent journey. Oxford University Press. ^ Parry, Gareth; Rawnsley, Andrew; Ezard, John (7 October 1985). "Policeman killed in riot". The Guardian. London. ^ "Metropolitan Police Service - History of the Metropolitan Police Service". 30 September 2007. ^ "Politics, race and the fight to inherit". The Guardian. 25 May 2000. Retrieved 17 February 2018. ^ Dodd, Vikram (23 July 2013). "PC Keith Blakelock: man charged with murder at Broadwater Farm riots". The Guardian. London. ^ "PC Keith Blakelock: Nicholas Jacobs cleared of killing officer". BBC News. 9 April 2014. On this day - 6 October. BBC News online. MP caught up in drive-by shooting. (7 April 2005). BBC News online.